Japanese anime, manga, and game characters sometimes have blond hair. Sometimes they have blue eyes. But, that's merely cosmetic, no? There must be some sort of analysis that cuts closer to the bone. Literally. A recent discussion on a Japanese web forum attempted to delve deeper and understand what exactly about Japanese illustration is "white" with a series of images that explicitly stated that cute characters are drawn with Caucasian features. Two skulls were produced, with that on the left reading " Caucasian " and the other reading "Asian". The image lines up with the images of two women, as well as two illustrations. There are arrows pointing out which parts of the skull are curved in and which parts curve out. There are also arrows pointing out the location of the eyes. The arrows then correspond to photos of a Caucasian female and an Asian female. The last image shows how these arrows then correspond to illustrations. The drawing on the left is not a Caucasian character but Japanese character Yui Hirasawa from K-On! 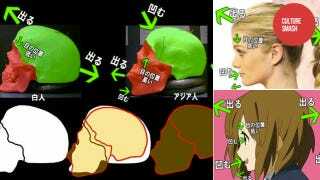 Even though these images apparently originated on a Japanese web forum, there are several problems with the images, but the biggest is that they seem selected simply to further this individual's thesis. As one Japanese forum commenter pointed out, "The choice of models is pretty terrible." In Japan, the white model might be considered an ideal Western beauty; the Asian model would not. A more valid comparison would be with someone like Koyuki, who is considered an ideal Japanese beauty. How would her features factor into this? The entire comparison is a wash. There are Japanese women who have small, petite faces and who are considered cute. There are Caucasian women who have enormous faces, who are not. Then, there are Japanese women who have large faces who are considered cute, just as there are Caucasian women who have petite faces, who are not. What is attractive isn't merely paint-by-numbers. There aren't laundry lists of features that denote attractiveness, and not all characters are created the same, with the artist holding an anatomy textbook or trying to draw "white" characters. It's akin to the myth that only thin people are attractive, which is completely false. Appeal depends on the person—and the character. The most attractive Japanese characters do reflect ideas of beauty that exist in Japan. Over time, those ideas have changed, which is reflected in each generation's popular art. However, the notion that only "white" features are valued and that all Japanese characters are based off white characters shifts the argument from line, form, style, to notions of race. If people in Japan look at these facial features and are supposed to think of them as "white", what does that mean for the Caucasians with recessed chins and foreheads and protruding mouths?